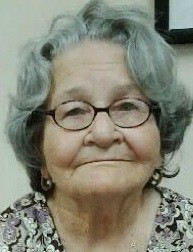 Rafaela Robles, 86, of 1708 Ohio St., Watertown, passed away March 25, 2019 at her home where she was under the care of Hospice of Jefferson County and surrounded by her loving family. The family will receive friends 1 to 4 p.m. Saturday, March 30 at the Hart & Bruce Funeral Home, 117 N. Massey St., Watertown. The Funeral Service will follow at 4 p.m.Saturady at the funeral home. Burial will take place in Brookside Cemetery in the spring. She was born on May 14, 1932 in Juncos, Puerto Rico, daughter of Anthony and Ramona Flores Robles. She grew up in Puerto Rico and emigrated to the United Sates in October of 1971. She resided in New York City where she was a home maker and moved to Watertown in August of 2010. She was a member of the Tabernacle of Worship in Watertown, she enjoyed cooking, watching tv, the outdoors, traveling and spending time with her grandchildren. Among her survivors are her two daughters and a son-in-law, Natividad Roman, Watertown, Carmen Torres and Carlos Canales, Watertown, a son Hector Torres Robles, Watertown, 13 grandchildren, several great grandchildren, her brother, Juan Robles, Puerto Rico, three sisters, Georgiana Robles, CT, Benny Robles, CT, Luc Robles, Puerto Rico, and several nieces and nephews.